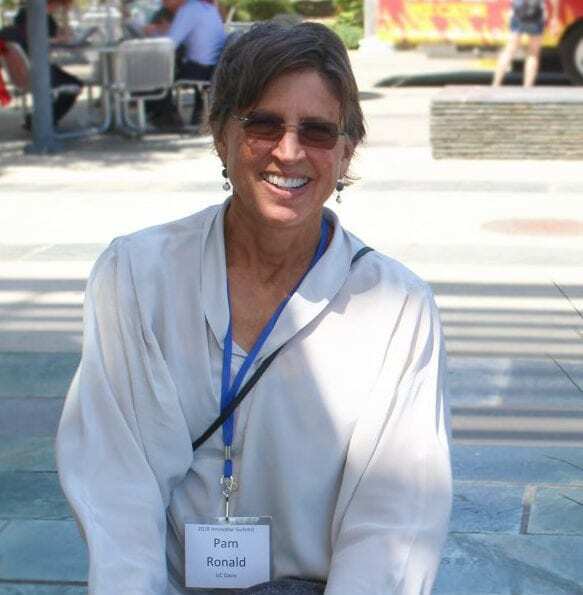 Pamela Ronald is a Distinguished Professor, in the Dept. of Plant Pathology and the Genome Center, UC Davis and in 2018 served as Visiting Professor in the Center on Food Security and the Environment, Stanford University. Ronald studies rice genes that control resistance to disease and tolerance to environmental stress. Ronald and colleagues received the 2008 USDA National Research Initiative Discovery Award and the 2012 Tech Award for innovative use of technology to benefit humanity. In 2014 she was named one of the world’s most influential scientific minds by Thomson Reuters, in 2015 was selected by Scientific American as one of the world’s 100 most influential people in biotechnology and in 2016 was named one of the 50 innovators and visionaries who will lead us toward a more sustainable future by Grist magazine. She is co-author of Tomorrow’s Table: Organic Farming, Genetics, and the Future of Food. Her 2015 TED talk has been viewed by more than 1.5 million people and translated into 24 languages.